We cater for exclusive Stag & Hen nights in the Mega Blaster World Arena or a venue of your choice such as your office space, warehouse, sports hall, exhibition hall, hotel event space, even a recreation ground in the summer months. Bride & Groom photo-shoots can also be arranged for an hourly hire rate, please e-mail admin@megablasterworld.co.uk for more information and prices. 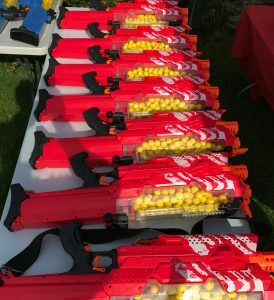 Our Adult Blaster Parties encompass both types of blaster fun, traditional & Rival, both with less pain and mess of the Paintball version and no extra costs for ammunition. The blasters we use are both fun, fast and easy to use but goggles must be worn at all times. We require a deposit of £100 to secure your date on our calendar, this can be made on line via PayPal or by cheque sent to our address, the remainder of the payment can be made via PayPal or BACS the day before your event booking.